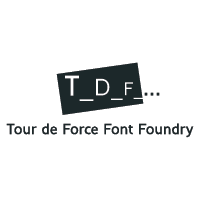 Founded by Slobodan Jelesijević and Dusan Jelesijević in May 2009 as an independent boutique font foundry that is the only one of it’s kind in Serbia, Tour de Force Font Foundry has produced high quality original typefaces that are in use globally. From our glyph laboratory in a small town of Gornji Milanovac, Central Serbia, we have anchored our craftsmanship and reputation on providing the classic European standards of stellar personalised service with our clients across the world. This is a service that believes in taking care of the little things – and perfecting little details that can make all the difference. Thus, by weaving our experience across different design environments and cultural spaces, we provide an intricate and instinctive approach to producing fonts that have the ability to bring out the best in your company’s advertising and branding campaigns.